You may have great products and services, but what if customers view them as mere commodities – easily provided by any number of suppliers? The challenge is how to help customers recognize – and be willing to pay for – the unique value your company provides. 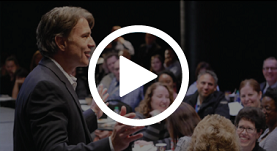 In this session, you’ll discover how to leverage your existing business with current clients so that they do more business with you in your other lines. Learn how to, as a result of that same conversation, ensure your best customers refer more high-end business to you and your company. Clarify what makes your company different, and why that difference is worth paying for. Ensure that customers remain loyal – other than by offering discounts. Stimulate pre-qualified word-of-mouth referrals – without pestering your client for leads. Deepen the trust and interdependency that customers have with you and your organization. To help you implement these concepts you’ll also receive a template and a memory jogger so you can apply these tools with customers in a natural, conversational manner. Thank you, Jeff for the incredible value you brought to our company. You provided the clarity, consistency and concise messaging we needed to ensure the success of our new product rollout.